This is a list of the short stories, novellas and other fiction writings, including poems, published by Kim Stanley Robinson, in the order of their first publication. Many of these writings were published more than once, and most have been included in short story collection releases. For a list of non-fiction publications, see here. 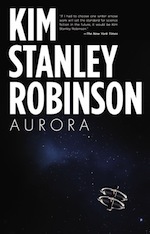 Robinson mainly wrote short stories in the 1970s and 1980s, in the beginning of his career as a writer. He has now acknowledged that his more recent writing habits have drawn him away from the short story format in favor of novels, however he does not exclude a future effort to pick back writing in shorter prose. The following abbreviations were also used: F&SF for The Magazine Of Fantasy & Science Fiction and IASFM for Isaac Asimov's Science Fiction Magazine. Short stories included in other English-speaking editions, not found in the pages dedicated to individual stories.